We like to begin with gross understatements sometimes. And yet, there is something delightfully simple and true here, too. Isn't it enough to just say it - God is complicated? ...Perhaps beyond our human ability to grasp all that means and that is ok? God is complicated. This Sunday is Trinity Sunday, a culminating day of sorts in the liturgical year. We have walked through the Advent, waiting and watching for the birth of Jesus, celebrated the incarnation on Christmas, and studied the ministry of Jesus, turned our attention toward Lent and Jesus' walk toward the cross, marvelled at the miracle of Resurrection on Easter and then witnessed God's gift of the Holy Spirit to the church during Pentecost. And here we are recognizing the generative and creative God who chose to walk amidst creation as an embodied human and then graced the church with a Spirit presence that is still moving. The concept of a Trinity - that God is really three distinct and unique manifestations - is really tough and theologians and scholars have invested lifetimes trying to understand and describe the Trinity. At one very base level, though, it just meshes with our experience. God is so much - how can we relate to God in only one way? It's easier to embrace God as creator, co-human, or spiritual presence, practically speaking. How about for you? In the reading from Proverbs, the writer describes "wisdom" as a presence that has always been and will continue to be. Wisdom is credited as "created" by God at the very beginning. And this meshes with opening of John, written much later and influenced by the Jewish understanding of Creation, where Jesus is described as the Word that existed in the beginning. A takeaway here is that this concept of God in multiple manifestations is not a strictly "christian" notion. The psalmist praises the Lord's creation and is marveling at the relationship of Humans to the rest of creation. This passage can make us wince a bit - with reference to human dominion over other created lives. This is certainly a verse that has been used to justify acts of destruction by humans in the created world. But in the context of Trinity Sunday, it also says something about God and the unique relationship that we as humans can access with God. Our very design somehow drives us toward a relationship with a God that we cannot fully comprehend. We have a gift of both rationality and faith and find ways for those to rest side by side. In Paul's letter to the church at Rome, Paul has been exploring our human relationship with God. This is t first mention of the Holy Spirit in this complex relationship. As he describes it, the Holy Spirit is a direct conduit between God's love and the human heart. So much of what we experience in life is complicated. And sometimes that can be paralyzing because we do not fully understand something or completely know the answers to every question. But what if we were to free ourselves of having to understand it all? What if we just accepted that there are many manifestations of God that we cannot comprehend....and do our best to connect with God in the ways we know we can connect? What if we accept what Jesus tells the disciples? when we need to know it. 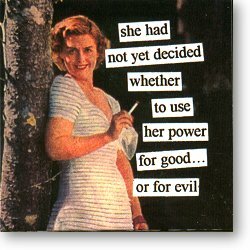 There is a popular line of stationery available that combines vintage 40s & 50s era photos or drawings of women with witty modern-woman thoughts. The juxtaposition of wholesome vintage images and modern irreverence are humorous. A current favorite depicts a beautiful woman in a flowing dress leaning casually against a tree, cigarette dangling in one hand, mischievous half-smile causing you to wonder about her motives. The caption reads, "She had not yet decided whether to use her power for good or for evil." Indeed. Some days, that is a tough decision. It's tough to discern our power. Then it's tough to discern good use of that power. And it's even tough sometimes to recognize the difference between Good and Evil. Matt had the opportunity this week to hear renowned neurosurgeon Ben Carson speak at a conference addressing issues of spirituality and medicine. Ben described his career choice as a discerning process -- he was good with his hands, could picture things in three dimensions and was interested in the workings of the human brain. BINGO! Neurosurgeon. And we all know successful people who turn their success into THEIR success. But Dr. Carson approaches his work with deep awe for a God that he cannot possibly understand and a keen recognition of his own limits of rational thinking. He recognizes that he has gifts and he puts those to work each day for the good of the world, giving honor to the God who created him with those gifts. Most of us don't have a story that is quite that clearly interpreted. Our gifts are perhaps less Concrete. At our house, we would point to our "Liberal Arts" degrees - not exactly boldly defined skill sets! Is putting a skill to work for material return evil? Good and Evil is a spectrum, right, with lots of room between the two? Just how far to the Good do we need to be? And what responsibility do we have to fulfill the Good we know we are capable of? If there is an option for doing Good in front of us and we do not take it, what does that mean? The lectionary readings this week swim around in these murky waters a bit, and cause us to consider the real outcomes of our choices. In the story from Acts, we begin with a girl who has some pretty exceptional powers - she is a slave possessed by a spirit of divination. She uses this "asset" to make nice sums of money for her master. Paul uses his "power" to cast out this spirit. And the master uses his power as a Roman citizen to accuse Paul and Silas, as Jews advocating unlawful behavior. The magistrates have the men beaten and jailed, but that night, an earthquake literally opens the prison. The jailer, afraid that he has lost all of his prisoners, is about to commit suicide, but Paul calls out to him - we're all here. It's OK. We haven't escaped. And the jailer is so overwhelmed by this turn of events that his eyes are open to God's power...power for good that is saving these prisoners, but they are not running away. He turns and asks what he needs to do to be saved. They share the good news of Jesus Christ and he takes them home, tends their wounds and they baptize his entire household. Now, a lot of things could have happened differently in this story, and it hinges on individual choice of how to use their Powers, Gifts, Abilities. The psalmist sings praises of the Lord who knows well the Lord's power and uses it in wise ways, recognizing the difference between Good and Evil. Ah to be that sure, eh? In John's Revelation we see several examples of folks using their powers for Good. We see Jesus telling us what he is going to do with his power and responsibility and we see him offering the invitation to anyone who hears him to 'come' and take the water of life as a gift. However, this is a great example of the two sides of power and responsibility--one side can use her power to extend an offer, but the other side must also use his power to accept it. Jesus is praying to God in the selection from John's Gospel, and his petition is on behalf of his followers, but also on behalf of those who will come to believe BECAUSE of these early followers. As he's facing his own degradation and destruction, he's praying for the continuation of what he began. He's praying for their future gifts, for their understanding of all that has and will happen, and for their strength to continue the work that has been begun. He's using his power to invest, in some way, in the future - to ask God to be present in them. It would seem that a key to being able to make good choices about how we use our Powers - for Good or Evil - has a lot to do with our connection to God and to others in the world. When we are drawing deeply from a well, engaged in conversation with God and with our community about how the world works and what the world needs, when we are caring for our gifts and tending to our own spiritual health, we are able to choose Better More Often. God, I want to choose Better More Often. I want to use what I have for Good. Better Place in Your Name. I don't need to be a rock star. I don't need to get the praise. I just want to do the Good I Am Able. I want to choose Better More Often. What are you waiting for?? Go out. Change the world. Bring forth the Kingdom of God. It's in your hands. Who, me? Are you talking to me? Me-the-Sunday-church-goer-who-reads-some-scripture-and-gives-to-those-in-need-but-really-just-tries-to-keep-my-head-down-Me? It's in MY hands? This week's lectionary readings remind us that "Christian" isn't a label or a creed. It's a Movement (and Movement implies Action, doesn't it?). So get moving. Perhaps you remember the story of Lydia told in the passage from Acts. There are a lot of cultural undertones to mind in this story. Lydia is a weaver of purple cloth. In ancient times, purple cloth would have been hard to make and would have commanded a high price and generally a royal clientele. So Lydia is a woman of means. And she invites the disciples in to baptize her entire household - family and servants - because it was the responsibility of the head of the household to tend to the entire household's spiritual needs. Now the disciples sort of stumbled upon Lydia and her household while responding to a vision that Paul received. They were moving - acting upon the direction they had been given, both by the resurrected Jesus and in visions and dreams. In the Revelation, John has been lifted up to a birds eye view, witnessing a New Jerusalem without a temple, without a sun and moon to mark its day and night, with no gates to hold people in or out. It's an idyllic space, marked by peace and light and goodness and LIFE. And we assume that the vision is recorded to motivate us - to move us past our struggling to understand all the events of the Resurrection and right out into the nations - the world - sharing that same vision. There are two options for reading from the Gospel of John. The first is Jesus telling his disciples about the Spirit that will be sent in his place when he is gone from the earth. The Spirit will act as a teacher and as a Reminder of all that Jesus taught. And today, the Spirit is available and Moving and Active if we are aware. And the Spirit is present for our own Motivation and Activity. The second selection is the familiar story of the Jesus commanding a man who had long been ill and begging at a well to stand up, take up his things and walk. It isn't the Laying on of Hands or the mixing of mud. Jesus tells the man to MOVE - to take action toward his own destiny. And finally, the psalmist offers us a reminder that 'praising' is not passive and useless. Praising God is an act where we are interacting with God and shaping our understanding of God and the vision of how Creation ought to be. Praising God is another way of bringing forth the Kingdom of God as we work on seeing ourselves, each other, and the world as God might see it all. But I would prefer if others would accomplish it. ignore the log in my eye. because it might be hard. because I am but one.